Aiden Palmer, a disenchanted WWI veteran, has gone from golden boy to troublemaker since his return from Europe. Hopping from job to job, looking for meaning and adventure, he finds himself running with a rowdy new crowd that puts pressure on him to join their illegal bootlegging runs. On the night the 18th Amendment goes into affect, he reconnects with a love from his past, Grace Currie, at a prohibition ball. Grace McAfee Currie is a teenaged war widow. On the night the Volstead Act becomes law, she searches for Aiden Palmer, the man she’d wanted to marry three years ago. Convincing him that she still loves him is no easy task. Will they be able to outmaneuver her power-hungry brother and outrun the competition to start a new life together? This is a sweet southern story of how thing really were in this time. Crooked controlling families hiding in the back and hiring others to hide their secrets and miss-dealings. The narrator did a nice job with the voice for the story, it felt as if you were watching the story as a movie. This wasn't as great as the first one but it was good. The characters were well rounded. The story line was predictable. It's a cute love story. Would recommend. The narrator's voice was perfect for the story! A WW1 veteran, a WW1 widow who were both once in love and wanted to marry meet again. Aiden Palmer, finds himself jumping from job to job and Grace McAfee Currie refuses to marry yet another upstart politician her brother wants to force her to wed. Reuniting Grace convince Aiden that she still loves him and they should run away, marry and live from their families. A very sweet, short novella. The author did a wonderful job creating it. However, for me, the narrator see to be in a rush in the telling of the story. This short audio involves two main characters Arden Palmer and Grace McAlfee Currie. Set after WWI during the Prohibition , Auden Palmer is a veteran returning to the US having been previously stationed in Europe. He is finding it difficult to return to American society. He becomes involved with a bootlegging gang while also making contact with Grace his former love interest. Grace McAlfee, a young war widow seeks to reunite with Aiden. Conflict arises as the couple is involved not only in bootlegging and interacting with criminals, but also recapturing their former love for each other. The book was a short easy listen and captures the “Second Chance Romance “ storyline. Essentially, a good read. I received access to this audio for the purpose of reviewing,however the insights and opinions were not solicited but of my own account. This is the second book in the Bryeton Series. This is a short and sweet novella. Unfortunately, I had difficulties to stay focused, but I can't say why. The narration was okay. 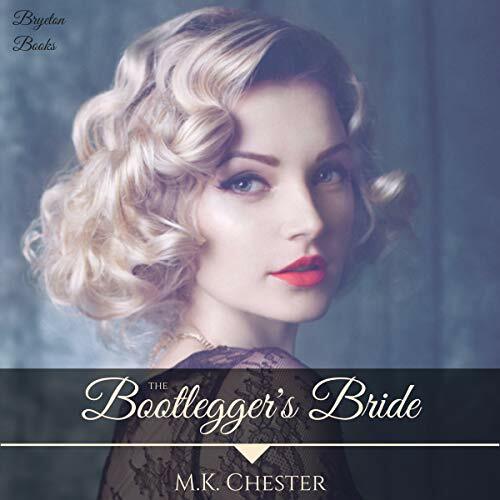 A short second chance romance set during the time of prohibition. Aiden has returned from the war and is reacquainted with Grace, who has recently been widowed. Will there be a second chance at love or will the illegal bootlegging activities keep them apart. A well written story with a great narration. This is one of those fast listens that is packed full of action and romance! Taking place as prohibition is being executed, Aiden finds himself in a position to make some fast money. The love of his life, Grace is ready to reconnect with him, but with all families, we find a bad apple in Grace's! Now racing the clock to their new life, we get to see power hungry individuals try to block their happiness. Will they find their way? I loved this short story. MK Chester has a way of writing that is so easy to listen to and entertaining that I get lost in the story. The characters are well developed and the story does not feel rushed. The narration by Brenda G Brown is perfect, her southern drawl exactly what I would expect from the characters. Highly recommend this novella! Very fast paced quick clean listen. This is more of southern style classic that takes place during the time of prohibition. Considering that I haven't read this author before, I feel like this was a great 1st impression. Has potential to be expanded into more but is a good standalone. The narrator did a good job in this performance. I feel like her voice brough out the southern feel of the story and was able to add to the setting. Since this was so short, there weren't a whole lot of characters, but the characters we did encounter seemed to have good voice differentiation.